G Hello, thank you for accepting our interview. First of all, can you introduce us to your exhibition in the Bund 22? Z can be said that this exhibition is a "performance report" I from the fashion department of the United States Pratt Institute to the British Campo Weir art school to learn painting! I always love painting, has been in the painting, but I did not really comprehensive to show off. So I hope that through this exhibition, I will be different types of creative thinking and personal presentation to more people. Let everyone in this space, feel my feelings, feel my thoughts.You G this exhibition named "Shendu LONER". How do you understand the subject and why do you use this "theme" to summarize your work in this exhibition? Z I am very concerned about the "lonely" feeling. I will attach great importance to some "lonely moments", sometimes pretending to be a lonely person ". Because, I think only when feeling lonely, is your most understanding of their own time. He will make you more sensitive to the response and feedback you give to your side. Now, we live in the hustle and bustle, but in the final analysis we are extremely "self"". So, I will be the exhibition named "the LONER", is to let you feel my loneliness, and thinking and writing by this feeling of loneliness that flowed out. G you have a very rich show in the show. If you would like to introduce us to a particular piece of work, you will choose which one to recommend to us? This work, for you this exhibition, but also plays the role of what kind of? Z if you let me choose a piece of work, I will introduce my image to everyone. In fact, this piece of work is my special creation of the exhibition works, but also my first image works. Want to recommend it, because the image is not simply a simple image of multimedia presentation, it is the visual, hearing, touch, smell and other sensory experience of the interaction of the art interaction. This image is divided into four parts, about the personal inner loneliness of a track. From an attempt to change, to follow the search, and then to the face of the dream of nothingness, until the end of the wait, it shows a series of changes in the protagonist of the process. If my exhibition described as a table of meal, this video is undoubtedly the entire meal before meals and salad. Because the focus of the entire exhibition is still a large number of my paintings, and this photographic works, it is from a variety of sensory experience, so that the audience "appetite", began to slowly understand and in-depth my exhibition works. G you have just said that your paintings are the most important of the exhibition. Can you please give us a brief introduction of the selection of the exhibition of paintings? Z this exhibition of paintings can be divided into two parts. One is my watercolor figure works, I through the open and smooth character body performance, show me to pursue the life state; another part is my digital creation. Said digital painting, in fact, it was a lot of criticism. 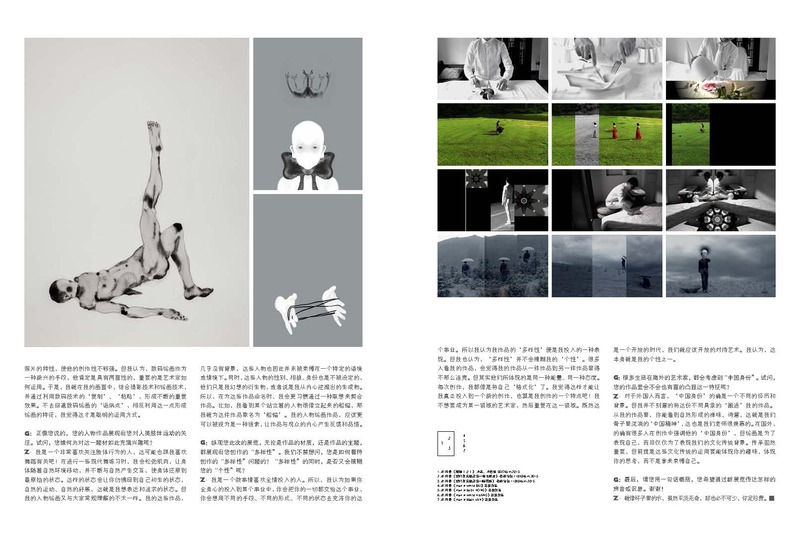 We think he's a "copy" and "paste" means and photo like characteristics, so his works is not strong enough. But I think, as a new means of digital painting, he must have two sides, it is important that the artist how to use. So, I am in my picture, combined with photography and painting technology, and through the use of digital technology, "copy", "paste", the formation of a constant repetition effect. Not to avoid digital painting "criticism point", on the contrary to the formation of the characteristics of the painting, I think this is a clever way to use. G as you say, your characters show your attention to the movement of the human body. You ask, why is so interested in this topic? Z I love attention is a very physical act, it may also tell me about love dance! In some modern dance practice, I will let the body relax the muscles, with the natural environment of mobile, and constantly interact with nature, make the body to restore the original state. Such a state will make you seem to return to their nascent state, the natural movement, the natural stretch, this is what I want to express and the pursuit of the state. But my figure painting is not the same as the general understanding of the people. I have almost no background in these works, and they are not bound to a specific context or context. At the same time, the gender, appearance, identity of these people is not set, they are just my fantasy derivative, or I dig out from the heart of the generation. So, in the name of these works, I will be more accustomed to fit through a combination of works. For example, I see a standing figure standing up like a boat anchor, then I will name it as a "anchor" for the work ". My figure painting works, it should be more can be seen as a clue, so that the work and the audience's heart to generate feedback and product awareness. G throughout your exhibition, whether it is the material of the work, or the theme of the work, all show the diversity of your creation". We can not help but ask, how do you look at the creation of the "diversity" of the question of "diversity" at the same time, whether it will blur your "personality" it? G a lot of artists living overseas, will take into account the Chinese identity". How can you work will not deliberately highlight this feature? Z for foreigners, the Chinese identity is indeed a different experience and background. But I do not deliberately put the different figurative "move into" my work. From my work, you can see the natural form of Zen and poetry, this is our inside flow "China spirit", which is the envy of our teacher. In foreign countries, there are a lot of people in the creation of the emphasis on his "Chinese identity", but the painting is to show their own, rather than just to show our cultural background. Inheritance is important, but the premise is that the use of these cultural traditions to be able to reflect your interests, reflect your thinking, rather than used to bind themselves. G in the end, please use a sentence to summarize, you want to convey what kind of sound or message through the new exhibition. Thank you! Z is like a glass of water, although the bland, but also essential, precious.